Captain Samuel Ward and his nephew Captain Eber Ward built several Great Lakes ships and contributed much to the growth and development of the Great Lakes. The story of Captain Eber Ward ended in January, 1875. At about 10:45 o’clock in the morning of January 3, 1875, he suffered an attack of apoplexy while walking on the west side of Griswold Street, between Larned and Jefferson Avenues in Detroit. He collapsed in front of the banking office of E.K. Roberts. He was at once carried into Mr. Roberts’ office and several excellent physicians attended him, but their efforts were all in vain. One of the doctors said that he probably was already dead within three minutes from the time he was lifted up in the street. Later, they discovered that Captain Ward had suffered a similar attack a few months earlier. The doctors immediately notified his family, friends, and many business colleagues in different sections of the country of his death. From his thirteenth birthday when he became a cabin boy on the Great Lakes, until his death, Captain Ward sailed on Great Lakes ships, built Great Lakes ships, and expanded Great Lakes interests. He added his life to those of many others who contributed to the growth and development of the Great Lakes. Captain Ward’s story begins in Canada, where he was born in 1811. His parents had fled to Canada from Vermont in 1811, to avoid the consequences of the War of 1812. After the war of 1812 ended, Eber’s parents returned with their family to the old homestead in the Green Mountain State, where they remained until he was six years old. His home was located in the town of Wells, Vermont. Not long after the “second Revolutionary war” had ended the tide of emigration resumed its westward march. In 1818, Eber’s parents with their family and many others traveled to the more lucrative fields of the south and West. They set out for Kentucky, but were delayed at Waterford, Pennsylvania, for some time, and here Eber’s mother died. They changed their course and went to Ohio. After a short stay in that state, they gradually pushed westward until they permanently located in Michigan. Eber’s father, had first visited Detroit in 1821. This was sixteen years after fire had destroyed the old town. At this time there was only one frame house in the town. The average buildings were made of logs with cedar bark roofs. At this time, the largest vessel that floated on the lakes was only of thirty tons burden, and when a ship arrived at Detroit’s solitary wharf, a curious scene took place. Men, women and children thronged the river’s bank to get a glimpse of the strange visitor. At this period, and for several years afterwards, the whole fleet of the lakes could not carry as much as one of the present large grain vessels. Not one of the ships navigating the lakes was owned in Detroit. There were but three or four then on Lake Erie, and most of them belonged to the English. A public vessel known as the brig Hunter was the only means of water communication between Detroit and Buffalo. E.B. Ward accompanied his father to Marine City in 1822, and in 1824 to Mackinac. Here he began his marine career by taking the position of cabin boy in a small schooner. At this time he was only about thirteen years old, but had wanted to sail on the lakes for a long time. He diligently worked his way from cabin boy to one of the first places in wealth and importance in Detroit and in Michigan. Samuel Ward, Eber’s uncle, was the leading shipbuilder of Marine City and Eber observed his energy and admired his enthusiasm. He called the youthful Eber from his sailor’s life, and gave him a clerkship in his extensive warehouse. This marked the beginning of Eber’s shipbuilding life. Being constantly in connection with interesting marine interests, he rapidly improved his business talents. The History of the Great Lakes sketches a picture of Marine City in Eber’s time. It was located on the St. Clair River near Lake St. Clair and was formerly known as Newport. Captain Samuel Ward settled there about 1819 and in around 1824 built a schooner of 30 tons, called the St. Clair. She was shaped like a canal boat, full ends, with rudder “outdoors,” and was tiny and schooner rigged. Captain Ward used the St. Clair to hold his stock and traded in general merchandise. He loaded her with skins, furs, potash and black walnut lumber for gun stocks in June 1826 and started for New York City. Samuel Ward arrived at Buffalo, took out the St. Clair’s spars, and towed her through the canal to Albany with his own horses. She was then towed by steam down the Hudson River to New York, and returned the same way to his home, making the voyage in eight weeks. This was the first vessel passing from the lakes to the ocean via the Erie Canal. He made several extensive voyages in his little St. Clair. Captain Ward also sailed her from Detroit to Buffalo. She sailed into the new harbor in Buffalo that had been cleared of the sand bar. He didn’t transship his cargo to a canal boat. Instead, he lowered the St. Clair’s masts so they would clear the bridges and was towed across New York to Albany. From Albany Captain Ward sailed the St. Clair down the Hudson. It was the first through voyage from the lakes to the sea and had a profound effect on Great Lakes commerce. The cost of moving freight from Lake Erie to New York Harbor dropped from $120 a ton to $4.00 a ton. The schooner General Harrison of 100 tons came out in 1835. She was “somewhat long and narrow, and somewhat cranky, but a good sailor.” E.B. Ward sailed her as mate and he owned a quarter interest in her. Later, he became master. He took command of the General Harrison in 1835, and managed her successfully until his increasing interests demanded his presence at Marine City. Both Captain Eber and Captain Samuel Ward were excellent seamen. Henry Schoolcraft wrote about the terrific storm of November 1835. He embarked November 2, 1835 at Mackinac for Detroit aboard a schooner commanded by Captain Samuel Ward. That same evening, a great storm blew up on the Great Lakes. Schoolcraft wrote that they had scarcely cleared the lighthouse when the wind increased to a gale. The crew reefed the sails and made every effort to keep under way, but the wind prevented it. In 1839, Captain Samuel Ward built the hull for the steamboat Huron No. 1, but didn’t have the money to finish it. His nephew Eber finished building the Huron and the Huron was placed on Lake Erie and run in opposition to a line of steamers at great profit. Eber later became a partner with his uncle at Marine City, where he continued a most successful business . In 1848, the Captains Ward built the steamers Franklin Moore and Samuel Ward. In 1851 four side-wheel steamers were built at the Ward Ship yard: The Arctic, Ruby, Pearl and Caspian. By this time Marine City contained several ship yards and had a population of 3,500 people. Many of the village residents owned lake vessels. In 1850 Captain Eber B. Ward withdrew his interest from the General Harrison and came to Detroit. Here a larger and less occupied field expanded his opportunities for success. From that day until the year of his death, he pushed his marine interests of Detroit forward with a steady, powerful hand. 1855, Ward built the Eureka Iron and Steel Co. along the Detroit River, which used the innovative Bessemer steel making process. 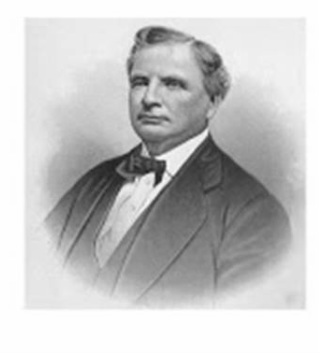 In 1860, he took over the presidency of the Flint and Pere Marquette Railroad and served until he died. Through his timely efforts Detroit commerce grew and prospered. Detroit’s floating property nearly doubled and Captain Ward and John Hutchins maintained a warehouse on the Detroit River for many years. Captain Eber Ward entered another long term endeavor in Detroit. He became acquainted with a family named McQueen who lived in Hamtramck. The McQueens had sons and daughters, and Captain Ward married one of the McQueen daughters, Mary Margaret and they had five children. Years later, Captain Ward divorced his first wife and married Catherine Lyons. They had a son and a daughter. Their daughter, Clara, was born in June 17, 1873, in Detroit, Michigan and grew up to marry a Belgian Prince. The names of the steamers and sailing vessels Captain Eber Ward built make up a long list. A few of his ships include the Marshal Ney, General Harrison, Huron, Ruby, Pearl, B.F. Wade, Champion, Pacific, Samuel Ward, Franklin Moore, Atlantic, Ocean, Arctic, Planet, Northwest, and the Montgomery. The Ward captains also built a number of smaller vessels. Captain Ward had other interests besides shipbuilding. With Dr. Increase A. Lapham, Captain Ward played a behind the scenes role in agitating for a United States Weather Bureau. The records don’t clearly state how the two men first came to know each other. It is possible they met onboard one of Captain Ward’s ships. Dr. Lapham often sailed on Great Lakes ships on his scientific expeditions. The Great Lakes history record definitely places him on the Sultana. Dr. Lapham could have initiated a correspondence with Captain Ward, because they were both intimately involved with the Great Lakes, especially Lake Michigan. It is more likely that they met when Captain Ward came to Milwaukee to pursue his business interests there. Increase Lapham had made countless observations of the rise and fall of water in Lake Michigan and determined the average level of water in the Lake. Engineers in Chicago and Milwaukee established the foundation of the sewerage works and water supply using these observations. Captain, later General, George G. Meade, used the observations for fixing the zero for soundings of the Great Lakes. In 1849, Dr. Lapham made a series of painstaking readings which enabled him to find a slight lunar tide in Lake Michigan, almost like an ocean tide. Also in 1849, Dr. Lapham put a self registering tide gauge at Milwaukee for the Lake Survey. During these years, Captain Ward and Dr. Lapham preached to anyone who would listen about the necessity for a weather bureau. For fifteen years, Dr. Lapham persevered in collecting weather data and documenting the effects of weather on Great Lakes shipping. In 1869, Dr. Lapham Congressman Halbert E. Paine, a report establishing the necessity for a weather bureau to prevent the loss of life and property on the Great Lakes. He proved it was practical to predict the frequency and intensity of great storms. He sent a long list of disasters that had occurred on the Great Lakes in 1869. It wasn’t until his own weather predictions, based on his long asssembled data were verified by the forewarned loss of property on the Great Lakes that Congress became convinced of the value of weather forecasting. Finally, in 1870, Congress approved the weather bureau and employed Dr. Lapham as special aide in the War Department at a yearly salary of $2,000 to inaugurate the weather service. The Signal Service office at Chicago sent out its first prediction on November 8, 1870, and the weather it predicted happened. Rejoicing, Dr. Lapham sent his first month’s salary home. He and Captain Ward had won the Weather Bureau battle. In fact, they had won the battle too handily. Their efforts elevated the weather bureau to national and international status and resulted in other men taking over their positions in the Weather Bureau. In the last few years before his death, Captain Ward had been gradually withdrawing from the vessel business and investing his extensive capital in another direction. He was invested to the extent of about one million dollars in the Chicago Rolling Mills, and half the amount in a similar corporation at Milwaukee, Wisconsin. His stock in the Wyandotte Rolling Mills in Wyandotte, Michigan, exceeded half a million dollars and his floating property was valued at about half a million dollars. He owned real estate to the amount of over two million dollars and had in the neighborhood of three million invested in different speculations. The efforts of Captain Eber B. Ward and Captain Samuel Ward linked the commercial interests of the Great Lakes to the Atlantic Ocean and thus to the rest of the world, Their ships and their enterprising spirits changed the history of Great Lakes commerce.